2000 Watt LED Grow Light, Full Spectrum UV IR COB Series Plant Grow Lamp, with D. 2000 Watt LED Grow Light, Full Spectrum UV IR COB Series Plant Grow Lamp, with D Size: 2000W. Welcome to AGLEX 2000W COB LED Grow Light, with strong light and broad nature spectrum 380-780nm, ideal for all kinds of indoor plants veg and flower at all growth stages, especially for medical plants. It is with High Pars value, High yields, Low heat. 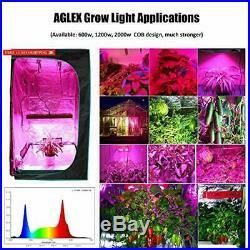 Main Features: AGLEX cob grow light bulb spectrum has been proved as a perfect spectrum for growing indoors, thanks to the latest white COB grow technology and high power double-chip LEDs. 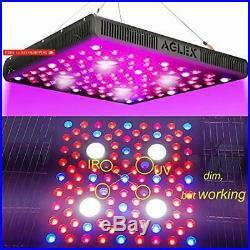 Big and high rotating speed fans are applied, make sure AGLEX LED grow lamps much cooler and quieter than others. UL high quality power cord used, safer and more reliable. Daisy chain feature makes your plantting easier. 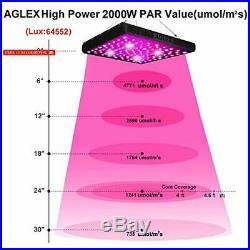 Specifications: - Model: AGL-2000W-C01 - Replaces a 1500 watt HPS/MH grow light - Dimensions: 16.5416.542.17 inches - Item Weight: 12.79 lbs - Full spectrum for all stages of plant growth - Coverage Area: about 55ft - Avg. 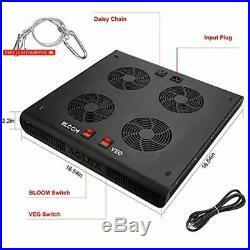 Power Draw: 408 Watt - LED Chips: High Intensity COB + Dual-Chip LEDs - Input Voltage: AC100-240V - Frequency: 50-60Hz - Lifespan: 50,000 hours Package Includes: - 1x 2000W COB LED Grow Light - 1x Hanging Hook Kits (Easy Installation) - 1x Plugs Power Cord (Double Use for Daisy Chain) - 1x User Manual Note: - Extremely bright, do not look directly at the LED bulbs when the light is on. Working UV&IR LEDs are dim, helpful for plant growing. Better to turn on Veg & Bloom for flowering; For seeding or young vegetative growth, you can turn on Veg only. Make sure this fits by entering your model number. 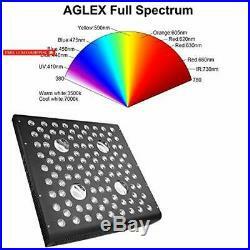 ADVANCED TECHNOLOGY - Aglex COB Reflector-series grow light, equiped with high-precision 90-degree lens and reliable COB Tech together, which can make sure 98% light souce can apply to your plants completely, make your plants healthier and happier. HUMANIZED VEG & BLOOM DESIGN - This LED plant grow lamp with veg & bloom switch setting allows you to switch on/off at any time for different growing stage, without unplugging, as well as keep an unnecessary electricity waste. Dasiy chain can help you to connect multiple lights, no worry about a tangled mess of wires. 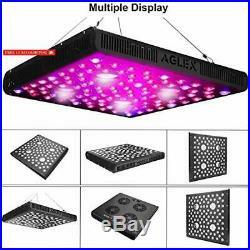 EFFICIENT COOLING SYSTEM - Large aluminum heat sink and quality big fans cooler running make full spectrum led grow light gives off very little heat as well as the grow light fixture works in quiet, extending a longer service. 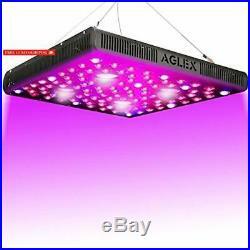 HIGH YIELD WITHIN LESS TIME - Aglex COB LED grow light full spectrum for indoor plants applies high power COB and double chip LEDs which most closely mimics the natural sunlight and delieveries strong light, creating not only better plants, but reduced growing time and overall cost. What Do You Get - 2000W COB LED Grow Light, US Power Cord, Hanging Hook Kit, User Manual, Our 3 years Worry-Free and Friendly Customer Servicce. Width: 16.5 x height: 16.5 x length: 2.2 x weight: 15.85. I work with several major retailers to assist them in moving their merchandise. If you have any questions, please do not hesitate to contact me. We stand behind our products. We do our best to process as quickly as possible. Please check the Voltage information and make sure it matches the one in your country. In case it's not stated in the description, do ask us. Most orders are in transit for two days but some may take longer. If you feel I can make improvements in my service, please let me know. My goal is always to have completely satisfied customers with high quality items. The description will include any flaws or defects that are noted with the item that is listed at the time of the posting. Thank you for shopping with us! The item "2000 Watt LED Grow Light, Full Spectrum UV IR COB Series Plant Grow Lamp, with D" is in sale since Friday, March 15, 2019. This item is in the category "Home & Garden\Yard, Garden & Outdoor Living\Gardening Supplies\Hydroponics & Seed Starting\Grow Light Kits". The seller is "gentleman-store" and is located in Phoenix, AZ.